The Professional Regulation Commission announces the official results of the Radiologic Technologist Licensure Examination and X-Ray Technologist Licensure Examination for July 2015. The Board of Radiologic Technology is the administrator for the Radtech and X-Ray Technologist board exam on July 5 & 6, 2015. PRC releases the 1,325 out of 3,043 passed the Radiologic Technologist Licensure Examination and 53 out of 210 passed the X-Ray Technologist Licensure Examination given by the Board of Radiologic Technology. Government agency commission will facilitate the exam to the cities of Manila, Davao, Iloilo, Lucena and Tuguegarao. Facilitate by the members of the Board of Radiologic Technology. PRC released the exam results in two (2) working days after the last day of examinations. So may expect the official exam results on July 8 or 9, 2015. The said board exam conducted once a year only and usually every month of July. Last year, PRC released the 1,258 out of 2,150 passed the Radiologic Technologist Licensure Examination and 43 out of 158 passed the X-Ray Technologist Licensure Examination. PRC promised that the date and venue for the oathtaking ceremony of the new successful examinees in the said examination WILL BE ANNOUNCED LATER, after they released the exam results. 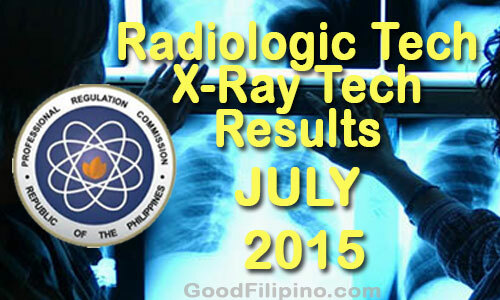 Comments or suggestions about "Radiologic & X-Ray Technologist Board Exam Results (July 2015)" is important to us, you may share it by using the comment box below.